The artist discusses visual poetry, Brillo Boxes and tearing down walls. Rubem Robierb’s work is as much about visual experience as it is about emotional experience. 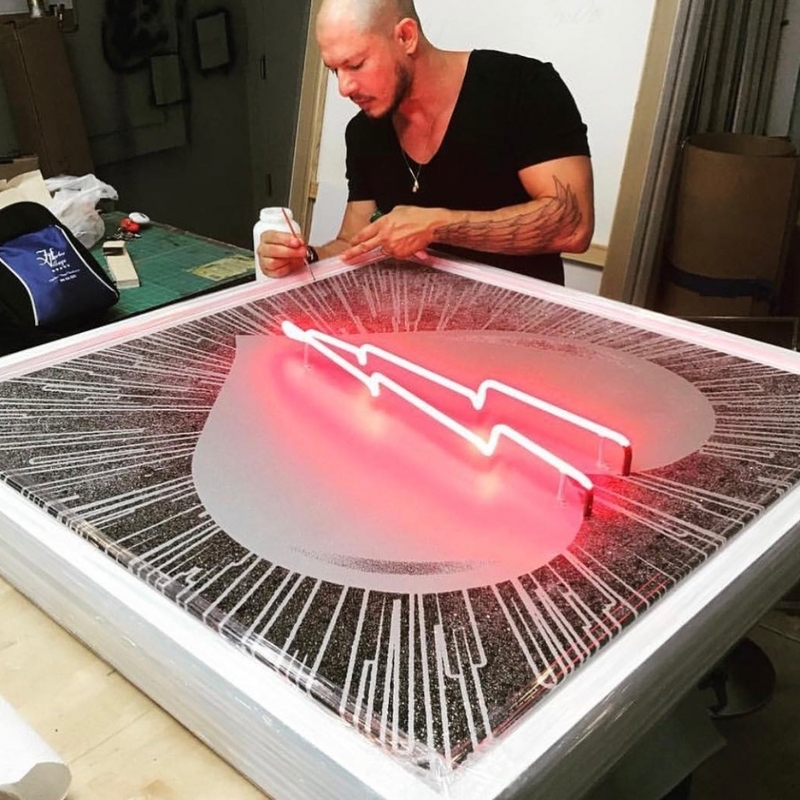 The Brazilian born, Miami based artist has a unique knack for taking the simplest, most familiar objects and symbols and exposing the complex, sometimes mystifying meanings embedded within them. In Robierb’s world a bullet can be beautiful, a butterfly can be dangerous, and a hundred-dollar bill becomes emotional currency. Don’t let the diamond dusted and Swarovski-crystal embellished façade fool you—beneath their shimmering surface, Rubem Robierb’s work is bursting with provocative themes that implore his audience to reevaluate their own humanity. I discovered art as a way of transforming my passion for poetry into something more visual. Using a single image to convey ideas or spark conversations became my new passion. While showing my work in São Paulo, Brazil, I was discovered by the French Art et Partage Association; who specializes in finding, sponsoring and exhibiting emerging artists from around the globe. At twenty-five they sponsored me in a series of solo shows in Europe (including: Paris, Aix en Provence, Milan and Zurich). Do you have a favorite series of yours? What about it is significant to your artistic project? It’s important for me to start powerful and meaningful conversations through art… and to do that requires total devotion of your heart, mind and energy—there can be no favorite. The "Bulletfly" Series is often called my trademark and I personally feel a powerful connection to the images. I am drawn to transformation and evolution as sources of inspiration as they have been two key concepts throughout my life and career. 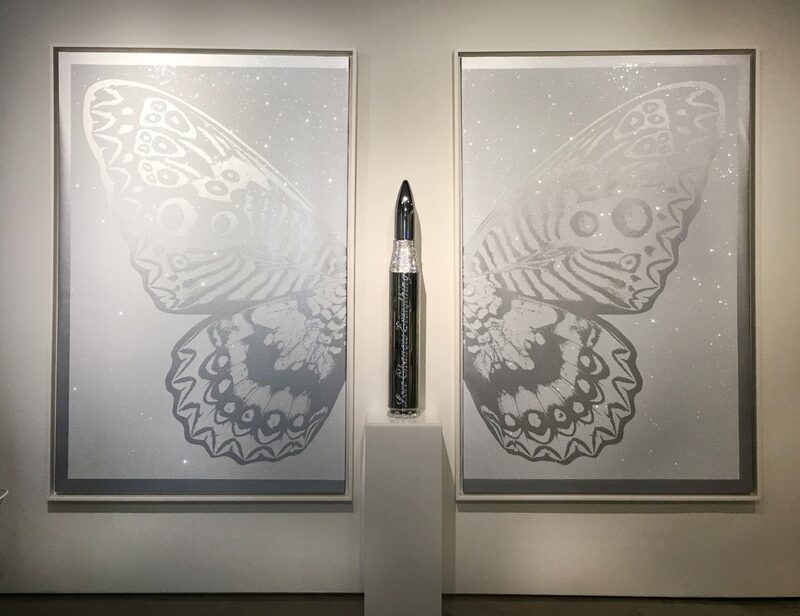 The butterfly and bullet are both symbolic of different kinds of transformation and together they make us face not only the bright and beautiful ways we evolve, but also the darker side of that evolution. Do you feel like your personal life and background has had an impact on how you approach your work? Totally. But also the lives of everyone around me. I am inspired by all elements of humanity and human experience; whether it be personal conflicts or global issues. One painting can stir emotions from many life experiences, like immigration, human rights, polarized politics, or the way we behave and take care of each other. An artist cannot isolate themselves from what happens in the world because art, for me, is often a raw, unfiltered mirror of these experiences. Your recent work seems to be increasingly more politically minded. Your piece “Prayers and Thoughts” (2017), which is distinctly modeled after Warhol’s “Brillo Boxes” from the sixties stood out to me for this reason. How do you see art as a tool for change and progress in our current political climate? What, for you, is the connection between the Warhol-esque Brillo Box aesthetic and the clichéd use of “thoughts and prayers” on social media in the place of real action? I am so glad that artwork got your attention. Though, I don’t see my work as especially political. I do see a world where even simple expressions have become overly politicized. I think “thoughts and prayers” has a pure ring of truth. One of the most comforting and even powerful phrases has somehow been twisted today. How could THIS be? I believe a message is sometimes more obvious to some than others… in the “Prayers and Thoughts” series, I turned to the iconic aesthetic of Andy Warhol’s “Brillo Box” because he, in the sixties, used its symbolic meaning to hold a mirror up to an increasingly mass-produced and materialistic society. By reproducing the image and elevating it to the realm of art, the public could comfortably have an open “value questioning” conversation. Today, I am inviting society to re-interrogate their values again. Is it possible we are so consumed with our own lives and experiences as individuals that we are desensitized to the pain, fear and suffering of others? We casually throw out the phrase “thoughts and prayers” with the same ease with which we say “I love you,” “let’s do lunch,” or “call me.” I hope we will look at these words and see them as important calls to action, rather than a tagline on Instagram stories. I hope this work serves as a mirror for us to check our reflection again today. What inspires you now? And what can we expect from your work in the future? My paintings or sculptures are meant to be read. They are poems without words. I hope that I can continue to help us see ourselves more truly in relation to the world within which we are constantly creating and changing. I hope that my art will allow us to find a comfortable place to have difficult conversations. If I could see my future art pieces in this light, I would be content and satisfied. The function of art should not be to decorate walls, but to tear them down. To make people reflect and think about who we are and what we can be. You can like or dislike my artwork, but if it begins a conversation… makes you think or reflect, I’ve achieved my goal. #Repost @rubemrobierbart ・・・ On display @taglialatellagalleries #NYC Please stop by ! "The heart holds such strong emotional and symbolic value so when juxtaposed with everyday signage and phrases, the underlying powerfulness of each emotion becomes even more evident - or maybe less significant? HEART is a collection of ironic, edgy, political laden and critical artworks that showcase Robierb's view of the world. The visually compelling and symbolically profound experience causes the beholder to reflect on the both universal and deeply personal question of 'what is love?" An expansive collection of Rubem Robierb's work is available and on display at our flagship gallery location in Chelsea, New York. For all inquiries please contact us at info@djtfa.com.